The Dow Jones Industrial Average was formed in 1896. It is easy to get caught up in the daily stock market activity and lose sight of the interesting facts in the market's history. For instance, while the New York Stock Exchange is the largest U.S. Stock exchange, it is not the oldest. The Philadelphia Stock Exchange was created in 1790 and preceded the NYSE. The NYSE, however, is the most traditional as traders cannot enter the floor of the exchange if they are not wearing a suit and tie. There are numerous milestones that have made the stock market what it is today. The history of the marketplace is filled with a variety of interesting facts. For example, the earliest version of the NYSE was created in 1792 on Wall Street. Wall Street is a not only a physical location in lower Manhattan, it is also a colloquial expression that can be used to describe the entire stock market. 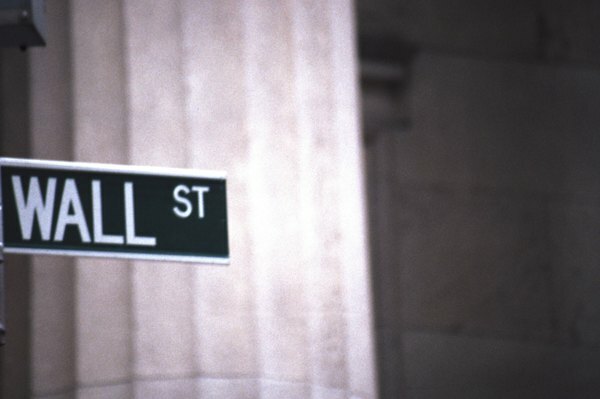 After all, it was on Wall Street where the NYSE was created its earliest form in 1792. A group of two dozen stockbrokers and store owners gathered under a buttonwood tree to create the Buttonwood Agreement, which gave them membership on the New York Stock Exchange. As part of that agreement, the Bank of New York was the first of five securities that began trading on the NYSE. Two of the worst stock-market crashes in which stock prices dropped precipitously occurred in October. As a result, the "Stock Trader's Almanac" considers the month jinxed. The first stock market crash occurred in 1929 when stocks declined 25 percent in two days and marked the beginning of the Great Depression. Decades later, in October 1987, stocks suffered a worse fate when the stock market lost nearly one-quarter of its value in a day, which goes down in history as the single-worst performance ever by stocks. Changes in stock prices were expressed as fractions until the year 2000. The U.S. trailed other major stock markets, including the London Stock Exchange and the Paris Bourse, in its decision to convert stock prices from fractions to decimals. In the late 1990s, U.S. congressional leaders enacted a law that required stock exchanges to change stock prices from fractions to decimals to make it easier for the average investor to understand stock values. The stock market rose to some of its best levels in trading sessions preceding stock market collapses. In 2000, just before the Nasdaq Composite started on a path on which it would lose nearly 50 percent its value, the Dow Jones Industrial Average set a new record by gaining almost 500 points in a day. In 2008, just before the U.S. economic recession began, the Dow Jones Industrial Average added more than 900 points, which represented the highest increase in the index in history.